If you look at a stock screener, you will see that Qualcomm (QCOM) stock currently trades at a P/E ratio of 20x earnings. For instance, if you type in “Qualcomm stock quote” into a Google search, you will see that Qualcomm closed on September 30th at $68.50 per share and has a P/E ratio of 20.08. I attach a screenshot below. This assumes that Qualcomm’s twelve-month earnings are $3.41 per share, and this assumption is incorrect because it dramatically understates Qualcomm’s earnings power. In late 2015, Qualcomm launched a significant layoff constituting 15% of its workforce. I don’t like it when companies simultaneously brag about their corporate responsibility while getting rid of thousands of people in the pursuit of billions of additional profits, but I would not be able to cover the investment arena if an unqualified moral endorsement were an antecedent condition to investing. And plus, a fair analysis involves recognizing the net benefit to civilization caused by Qualcomm’s brilliant engineering of modems that are present in devices such as the Apple iPhone. But as a factual matter about earnings, Qualcomm’s $3.41 figure is an understatement of true earnings power. Because Qualcomm offered large severance packages to laid-off employees, and because it had to incur many charges related to the employment attrition, the prior year’s earnings are understated by $1.25. This puts Qualcomm’s twelve-month earnings more in the range of $4.66. This is a P/E ratio of 14.7! Better yet from a shareholder perspective, there are other signals that Qualcomm’s stock is poised for expansion in the future. It earns a significant amount of revenues in China, where its long battery life and fast modem speeds have led to licensing fees that total nearly $7 billion. The company has been surprisingly successful in cracking down on international fee dodgers, with recent reports that it has added $400 million in licensing fees from Chinese factory rouses that were calculated to underreport the number of Qualcomm modems sent into the stream of commerce to third parties. Coupled with the strong dollar, this could add another $0.30 to earnings. You can fairly make the argument that Qualcomm’s true earnings power on a constant currency basis could be measured according to a P/E ratio in the 13 range. And while I strongly disfavor the use of layoffs to support repurchases, it is nevertheless true that it has a salutary effect on earnings per share growth. In 2012, Qualcomm had 1.71 billion shares outstanding. That figure is now down to 1.43 billion shares. That means Qualcomm stock has boosted earnings per share by 4.37% annually since 2012 alone. Coupled with the current 3.09% dividend yield, you can probably see why I like it. Even without core improvement in earnings, you’re slated to receive about 7.46% returns going forward. Put another way, Qualcomm only needs to grow core earnings per share by an amount greater than 2.54% annually to give its shareholders returns that outstrip the historical performance of the S&P 500. There is also some balance sheet strength thrown into the mix. Qualcomm has $17 billion in cash against $11 billion in debt. You get dividends, buybacks, a billion-dollar cash surplus, and a low earnings per share requirement to beat the historical performance of the market, and that puts new investors in a position to reap the benefits of significant margins of safety. It is especially crazy to study how much the winds of fashionability have weighed upon the long-term results at Qualcomm. 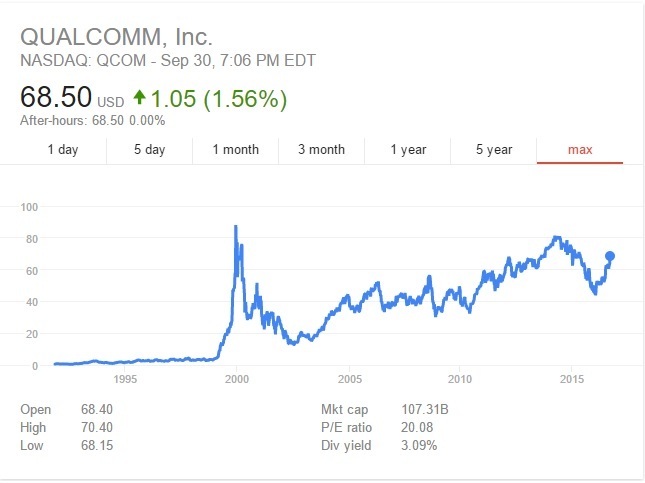 Bought QCOM stock in 1991? You would have compounded at 22.5%, turning a $10,000 initial investment into $1.5 million today. Heck, your quarterly dividend would be higher than the initial amount of capital that you put up to make the investment. Wait until December 1999? You would have been stagnant over the past seventeen years, turning $10,000 into $9,500 for an annual loss of 0.3%. Bought it in June 2010? You would have earned excellent 13.3% annual returns, which is extra-impressive if my contention that the stock is currently undervalued proves correct. Wait until April 2014? You’d be down 10% in total on your investment right now. But the numbers strongly support the assertion that now is a good time to take a good look at Qualcomm stock. The earnings are understated, and the P/E ratio is more attractive than you might otherwise think. The dividends and buybacks are rolling in. The balance sheet is strong. And it won’t take much in the way of earnings growth for Qualcomm’s stock performance to beat the S&P 500.